When I last wore my fuji hitoe, I noticed that the sleeves had been hemmed up. Intrigued by this discovery, I restored them to their original length, and tried it on again today. Now that 15 May has passed, it’s time to wear unlined kimono and nagajuban. Before and after! I wore a hanhaba obi that’s 18cm/7″ wide, so once again it’s interesting to see how the proportions change the overall look. With the longer sleeves and wider obi, I almost look short! There’s also a side view with the hanhaba obi. I like how the wisteria go all the way to the sleeve corners now that they’re longer. Today I tried tying my obi even wider: 20cm (8″). (Larger photo.) So far I like this width the best, it seems to give the best overall proportions. The obi I’m wearing is the same as in the previous post, just the opposite side! I chose a wisteria kimono for this month of May, which is when wisteria come into full bloom. 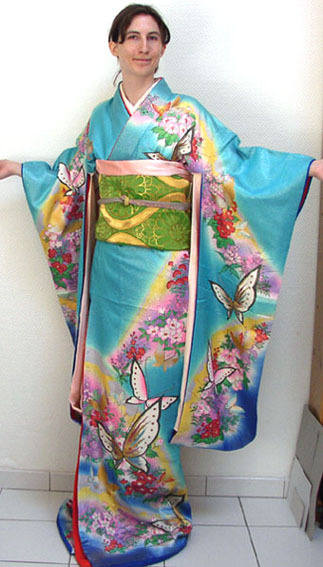 It’s unlined, so technically it’s a bit early to be worn yet (unlined kimono are worn starting from 15 May). The idea is to find which proportions look best on a person. 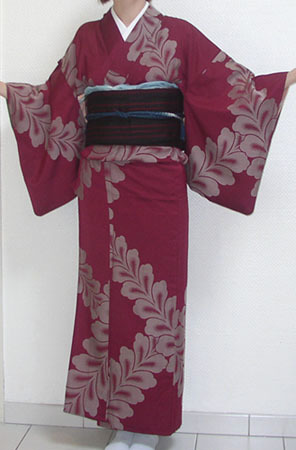 Normally 6″ is the proper width, however on taller women a wider obi can look better. I’m 180cm (just under 5’11”). And apologies for the bad lighting, my apartment is difficult that way. A couple weeks ago I tried on a new hikifurisode that I got for a steal on ebay, with the fukuro obi tied very wide, just for experimentational fun: photo here. Only 3cm (1″) is folded under at the bottom. It came out looking a bit wrinkly due to the fact that the obi ita (stiff support) is only half that width, but makes for an interesting study in proportions. The obijime would need to be wider for it to look best, I think. I received my mokume shibori kimono in the mail last week. Pardon the clich��: it took my breath away. The photos posted earlier hardly do it justice: the shibori is astonishing. My gallery has been updated to include it and a beautiful komon with dark dyed stripes, acquired at the same time as my mokume shibori kimono. I took new photos of both. An article in yesterday’s news on an exhibit titled “Art of the Japanese Postcard” lead me to the Boston Museum of Fine Arts website, where nearly three thousand unique postcards are available to browse online! They’re very nice quality images, and if you have a Java-enabled browser, you can zoom in on them. I had time to browse Japanese sites today and found all sorts of neat kimono diaries (blogs). They can be found in the “links” menu at right. All the new additions are in Japanese; if you can’t read the language, I recommend @nifty’s translation service. Copy a URL, paste it into the URL field and select the bottom menu item to translate from Japanese to English. (The larger field below is for translations of text.) Enjoy! As an explanation of my links organization: the “links” menu on this page is for personal sites, while the online references and recommended pages (under “divers”) contain links to informative sites on symbolism, kitsuke, galleries, sellers and more. A few weeks ago I came across a vintage book published by the Japan Tourist Bureau in its English-language series on Japan, titled “Kimono” by Kenichi Kawakatsu (whose first name is also transliterated Ken-ichi). There are two editions, one published in 1936 and another in 1956. While there are other publishing dates, the first is series #13 and 101 pages long, while the second (first published in 1956, apparently) is series #3 with 135 pages. No ISBN for either. You can find copies of both on Amazon’s zShops by doing a search for Kawakatsu (due to the different transliterations of his first name, to get all results just search for his family name). I’ve seen the 1956 edition sold on eBay from time to time as well. Please save any photos you like to your computer (right click on a photo and choose “save image as”) because my website does have a monthly bandwidth cap. The photos vary in quality in the books themselves, so if you see speckles, bad contrast and such, they’re in the original too, although I’ve cleaned them up a bit. These are about twice the actual size. The most interesting photos – in my opinion at least – are the kitsuke directions! In the 1936 edition these illustrate how to tie an otaiko musubi (numbers 24-30, there are no written directions). The 1956 book, on pages 42-46, both describes and shows how to put on a houmongi and tie an otaiko musubi. The main difference in the otaiko musubi is that in 1956 its shape was more standardized, tied with less of a tilt. 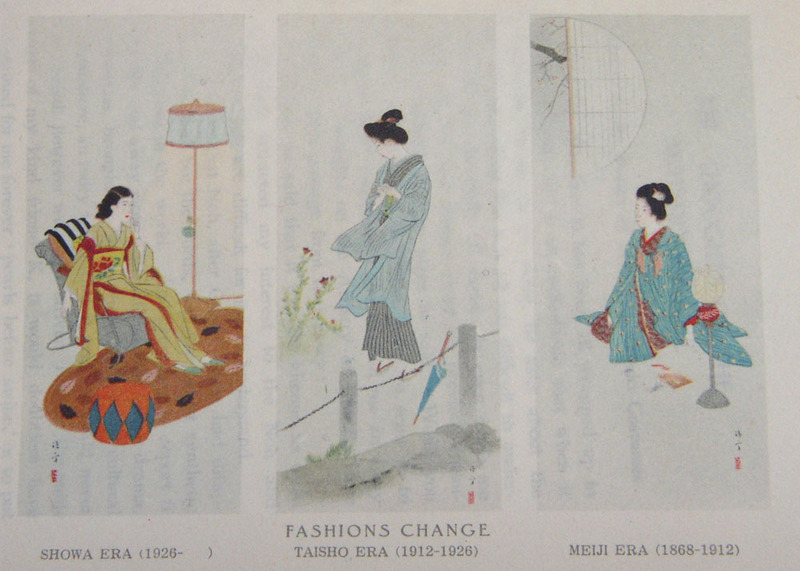 Also in the 1936 edition, photos 16 and 36 have the same lady wearing a wonderful shibori haori. Photo 18 shows “best zouri for young ladies”, intriguing because I’d never seen ones like that before! The “fashions change” plate is interesting as well (it’s slightly transparent, which is why you can see the page behind it). In short, if you come across these books and can afford them (I paid about US$20 for each on Amazon’s zShops), I recommend them for their vintage appeal. My curiosity being piqued by this recent arrival, I tried it on yesterday to see how it would look with an obi. The obi I’m wearing is one I made myself two years ago for a costume, out of some tapestry-weight fabric. It’s 12″ (30cm) wide and about 10′ (3m) long. Unlined, but folding it in half makes it sturdy enough to stand up without wrinkling – I wore it without an obi ita. I think it looks better when worn? Had to cheat a bit on the length again, as it’s not quite long enough to be worn longer with an ohashori (fold at the waist). I used a koshihimo instead of a kohlin belt, my third try this way – it really does seem to work better, it’s easier to adjust the collars properly and no wrinkles are formed if you’re careful. 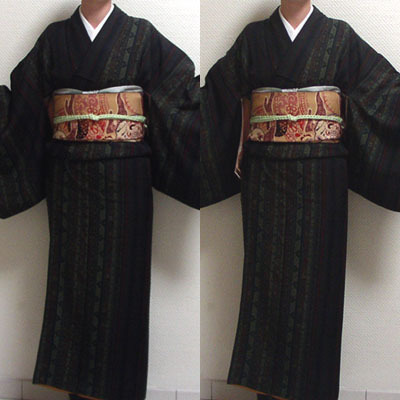 This kimono’s weave is strange, rough and a bit stiff. None of my other woven kimono are as rough, in fact they’re all very soft – the two tsumugi are nice and crisp, very easy to fold. 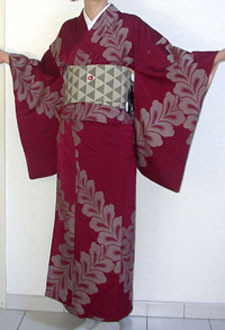 This one isn’t crisp, though its stiffness makes it easier to dress in than kimono made of satiny silk. 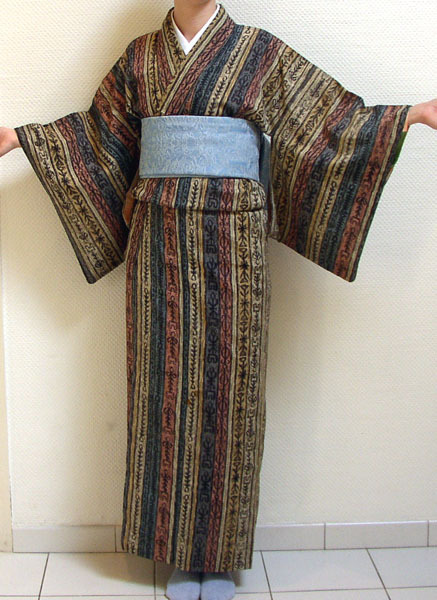 In any case, it will make a nice around-the-house kimono if I ever get myself in gear and start wearing kimono that way regularly.